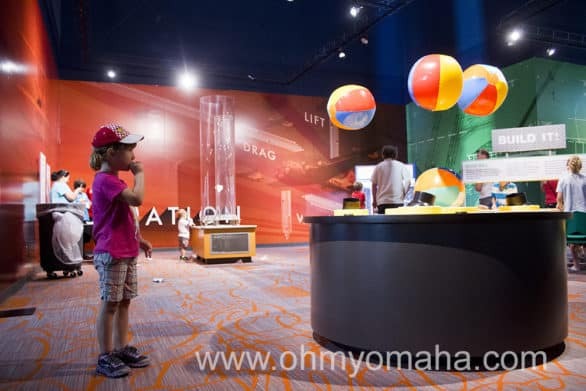 The Strategic Air Command and Aerospace Museum has created a space for children of all ages to explore STEM ideas (that’s science, technology, engineering, and math). 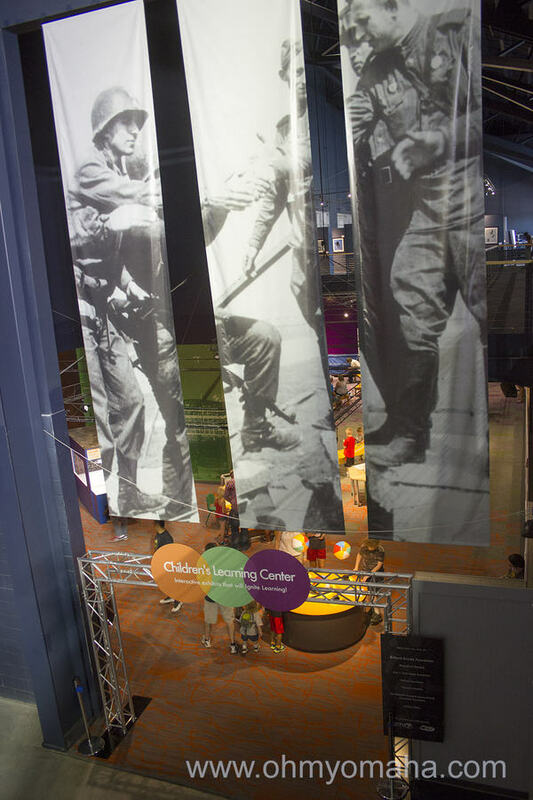 The Strategic Air Command and Aerospace Museum opened the new Children’s Learning Center in early August 2016. The new Children’s Learning Center opened last weekend. 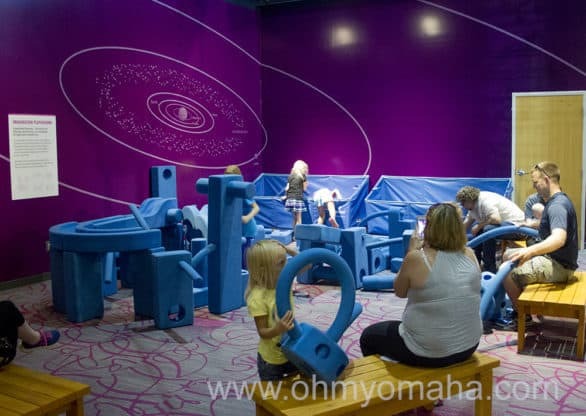 It consists of 10 interactive stations designed as an out-of-classroom experience for children to experiment and learn about science, technology, engineering, and math and the physics, forces, and technology of flight. Families can easily spend an hour here, especially if the children get into building structures at a couple of the stations. 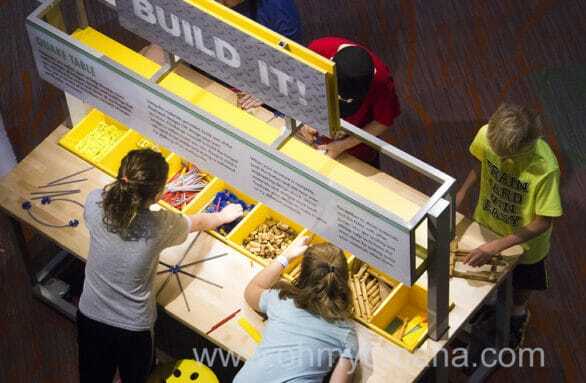 One engineering station asks kids to build a building or bridge the can stand up to an earthquake. I explored with my preschooler and first-grader and they had as much fun as the older kids there. Some activities were better suited for the limited patience of little ones than others, but with the help of an adult, they could build and experiment alongside the big kids. Thank you to the Strategic Air Command and Aerospace Museum for the complimentary passes so I can visit and get some great pictures. It was a fun day! The Bernouli Blower was a beacon for little ones with the the colorful beach balls. Bernoulli Blower: Discover the principles of airflow and how air speed and pressure effects objects, like beach balls. KEVA Planks: Create structures and gain first-hand experience with balance, leverage, geometry and the principles of physics. Children build structures that can stand up to the shaking earthquake table. Make-it-Tables: Experience the engineering design process by building machines or structures using materials provided. Interactive Kiosk Station: Explore the four forces of flight. 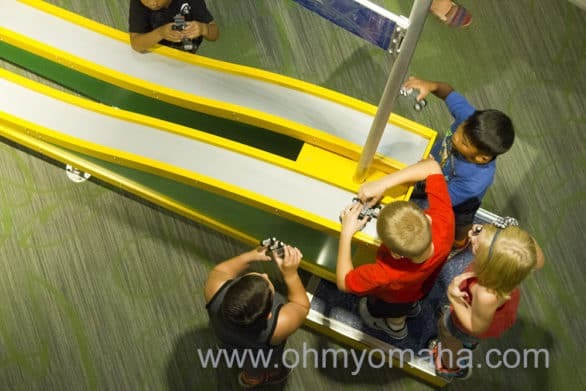 Kids race their LEGO cars on a test track at the Children’s Learning Center. Wind Trainer: Learn about the science and technology of flight in terms of aircraft roll, pitch and yaw. Dual Test Track: Learn how friction, drag, weight distribution, and gravity affect the design and operation of aircraft and other vehicles. The area with the large blue foam blocks was like a free-play engineering playground. Innovation Station: Create inventions, environments, and activities with large scale foam blocks that encourage teamwork and imagination. Quake Table: Design structures and explore the phenomena of earthquakes and their effects. The tennis ball launcher almost always had a wait on opening day. There’s something making things airborne that draws a crowd. 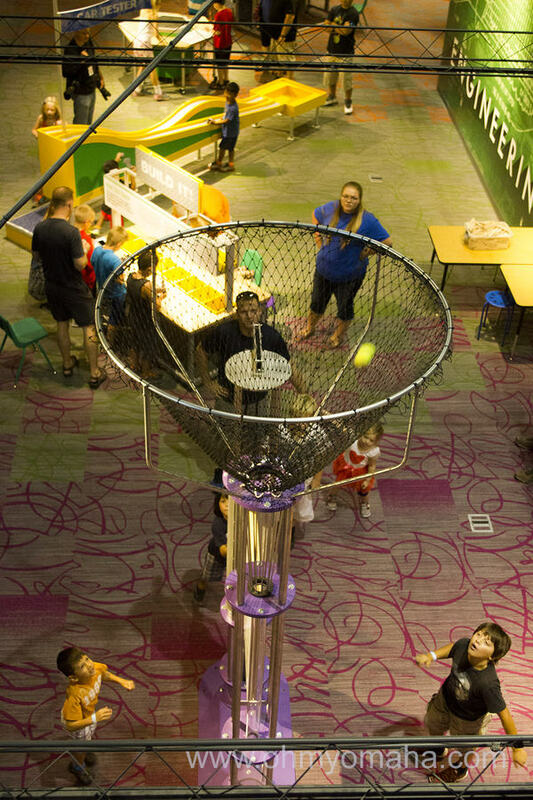 Tennis Ball Launcher: Explore the effects of gravity on different sized and massed objects. Twin Air Blaster: Experience how airflow impacts aircraft design. What else is for kids at the museum? If your kid loves planes, you’re set. This place has a ton of them, and many that you can peek inside. There’s also an area dedicated to Nebraska’s astronaut, Clayton Anderson, who’s from Ashland, Neb. 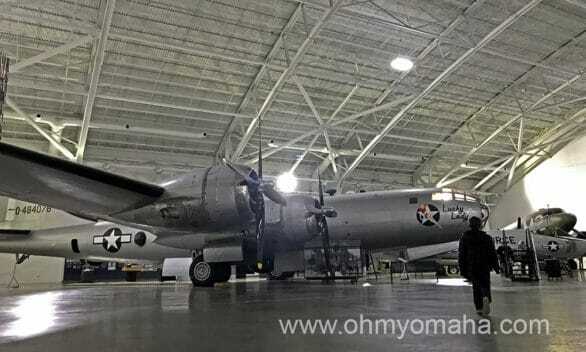 It’s truly amazing to get such a close-up look at so many airplanes at the Strategic Air Command & Aerospace Museum in Ashland, Nebraska. 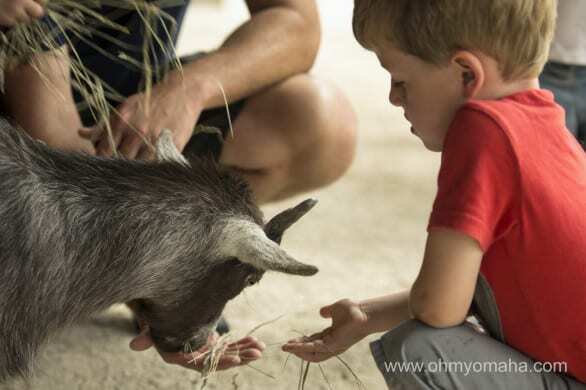 There are a few items that are an additional cost to admission, but can be a big hit with kids. When they were younger, it was the 50-cent rides. Now, they’re all about the flight simulators. 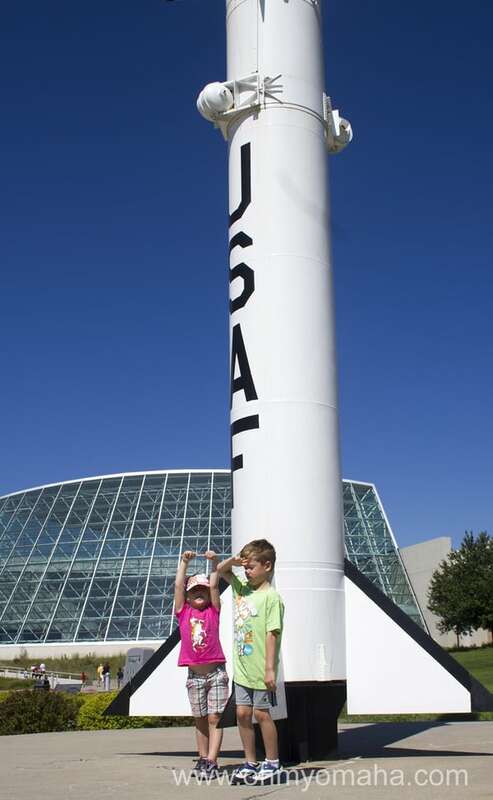 The Strategic Air Command and Aerospace Museum in Ashland, Neb., is a must-visit if your kids are fascinated by airplanes and spacecraft. The museum also regularly has traveling exhibits now. 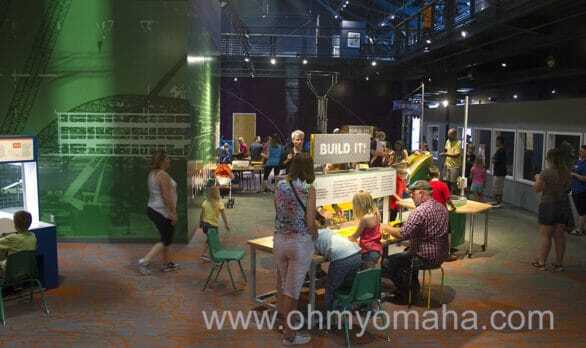 Read about those and other things to do with kids at the museum in this post about what’s new at the museum. Extras: Fight simulators, 2D rides are $9 for members $10 for non-members, and 3D rides are $12 for members $13 for non-members. Here are a few of the upcoming events and programs offered at Strategic Air Command and Aerospace Museum. Find more events here, and explore the educational offerings here. 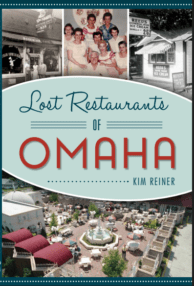 I’m torn about the traveling exhibit at the Strategic Air & Space Museum in Ashland, Neb. 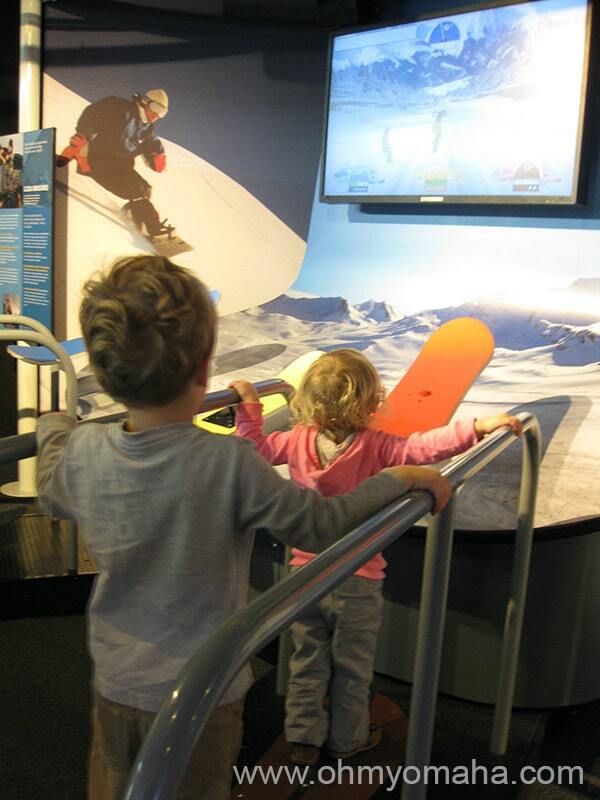 “Math Alive” is supposed to inspire kids about math using pretty cool interactive displays… and all I want to do is leave my kids at home so I don’t have to wait my turn at the snowboard game. If they’d made the climbing wall big enough for adults to use it, we parents would claim the exhibit “ours” and never bring the kids. 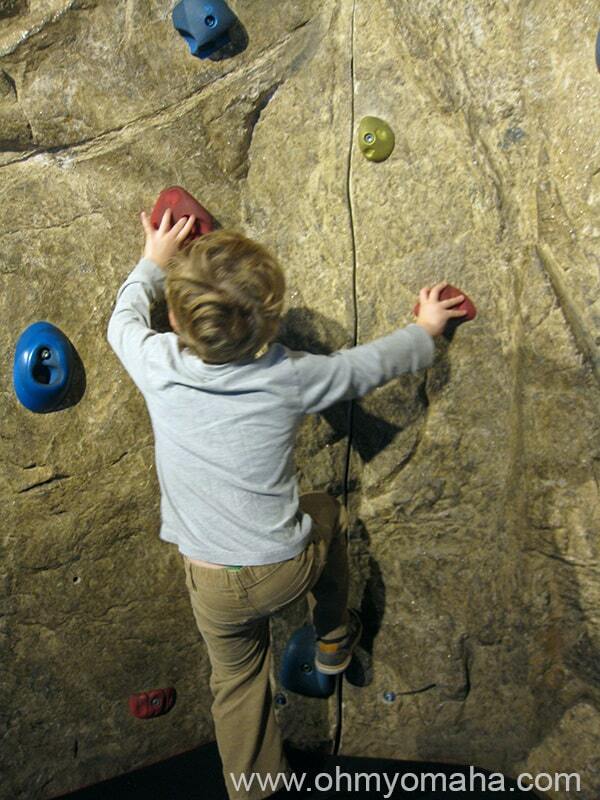 The climbing wall at “Math Alive” was too small for me… my only complaint. Alas, it is truly an exhibition designed to entertain and educate kids, and I’m not really that selfish. 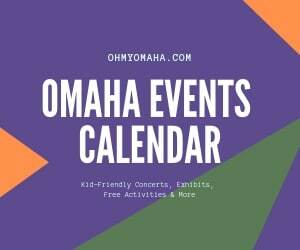 You really ought to check it out before it ends on Jan. 5, 2014. The appeal is clear – it’s highly interactive with engaging graphics and hip pros celebrating math – from musicians to engineers to skaterboarders, math looks cool. It’s engaging for all ages, but I’d say kids in grade school on up will get the most out of it. Take a look at the featured videos and interactive games. My kids tested a bicycle game and boardercross game. The instructions were over their head and they were just a tad too small to move the pedals, but they had fun doing what they could. My kids perpetually wiping out while virtual snowboarding together. 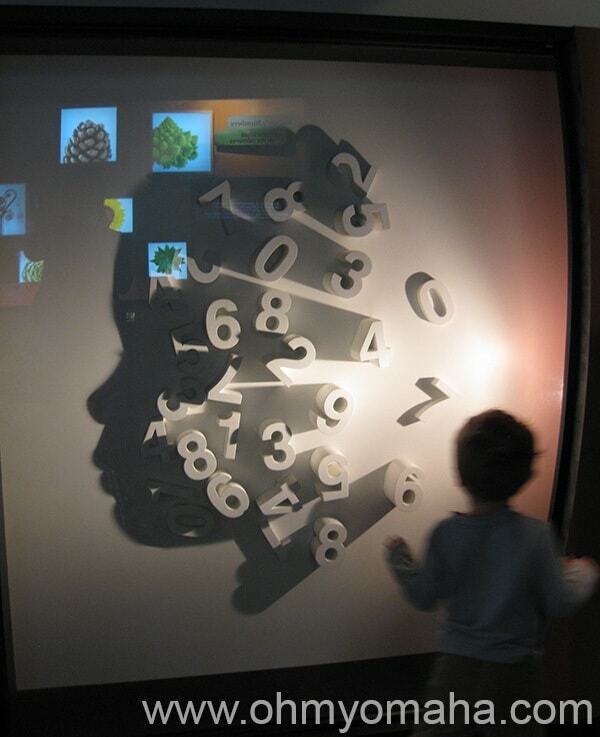 Obviously, if your child enjoys math, he or she will love it. The exhibit’s creators, though, went out of their way to make this appealing to the math challenged. My kids are attracted to bright lights, much like the common moth. Tough call. The kids’ were drawn to the adventure sports stuff like the snowboarding game and climbing wall, as well as anything that was flashing lights (which, let’s be honest, was a lot of stuff there). I would’ve liked to check out some of the stuff in the design area. The display that seemed to draw the most people to it was the 360-degree image generator. Twenty cameras take your picture from every angle while you strike a pose, and then the resulting image/video is emailed to you. I could’ve played studied the concept for 20 minutes had the kids stayed still long enough. Fun with shadows at “Math Alive” at the Strategic Air & Space Museum in Nebraska. According to the Math Alive website: The exhibition is designed to answer the age-old question: “Will I ever use all this math they’re teaching us?” Having an answer to that question is reason enough for me. I say, if your kids used to love playing at the children’s museum but they think they’re too old for it now, they’d have a lot of fun here. 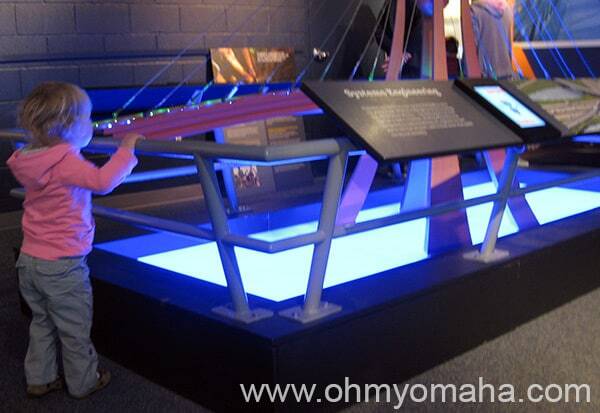 If your kids are young and still enjoy the children’s museum, take them to this exhibit. And if you don’t have kids, check it out and play all the games you want there without guilt of wanting to nudge your child away from the screen so you can get a chance to play. (Sorry about that tiny rock wall, though, it’s just not for us). 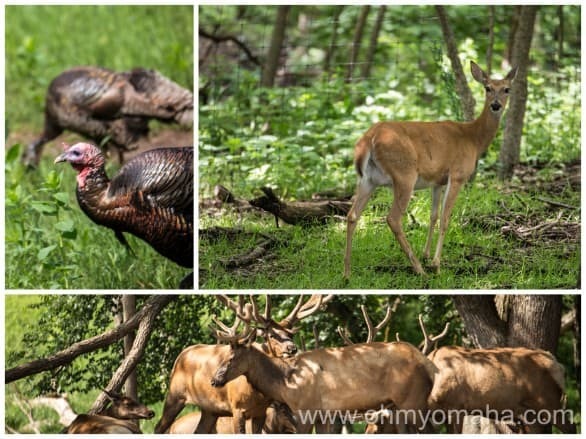 Eugene T. Mahoney State Park is a fun day-trip from Omaha or Lincoln, but there’s so much to do, I recommend planning at least staying overnight if not longer. Especially if you have kids. Especially if you have to factor in naps. 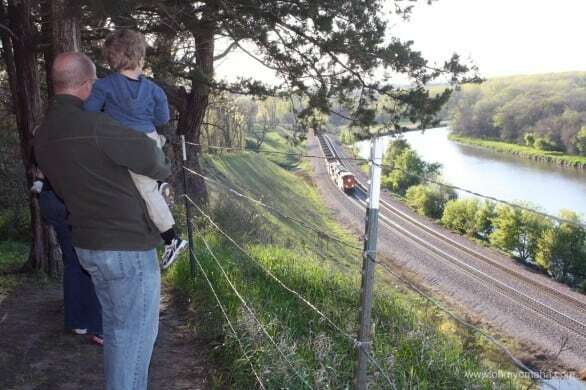 Mahoney State Park trails often lead you to a great river view, and if you’re lucky, you’ll catch a passing train. 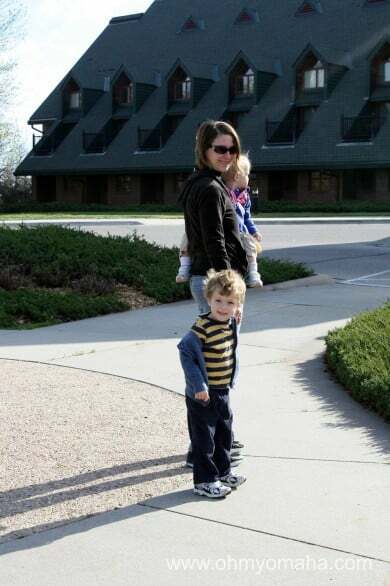 For my two kids, it was one of the highlights of the whole weekend. 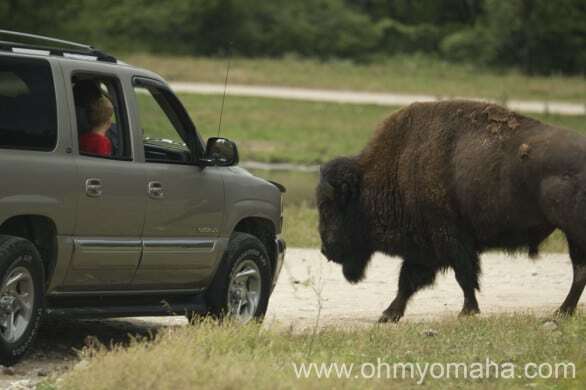 The park offers camping/RV parking, a hotel and cabins. We have yet to camp with the kids, but there are are nice campgrounds near the main lake (the paddle boat lake, as I’ll call it for simplicity’s sake). Most of the lodge rooms have balconies. Yeah, you might not want to lean to hard on that screen window, dear. For cabins, your options include two-, four- and six-bedroom cabins. We opted to stay at a two-bedroom cabin this spring – I highly recommend it. 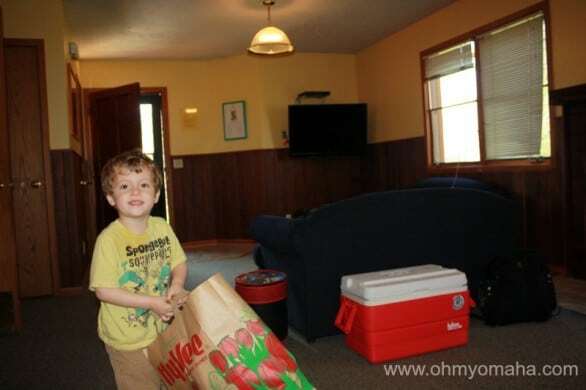 They have AC, appliances and dishware, bathtubs, grills, and for those who like going to a state park but not going outside, they have satellite TV. Ours had an included deck with not-too-sturdy netting (if your child often channels The Hulk, best keep a close eye on her while out there). For dining, our cabin had two picnic tables and a dining room table. There are now even nicer cabins available. All cabins, new or older, can be reserved up to a year in advance, and many are already filled up for next summer. The living room of one a two-room cabin at Mahoney State Park. Nothing fancy, but also not roughing it. 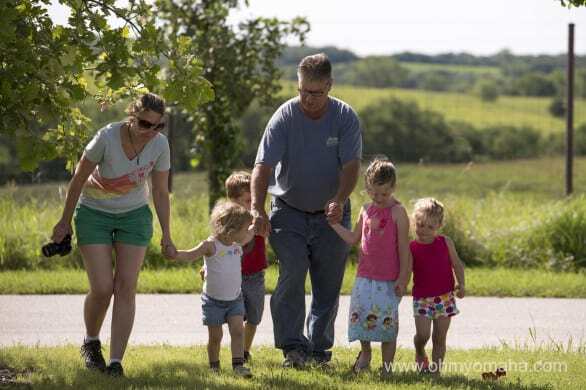 If you’re ready to go camping or to reserve a cabin, click here to check availability. 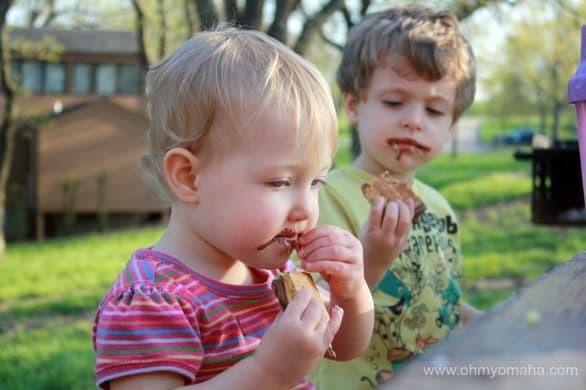 You never forget the first time you had a s’more. Cheers, Mooch! 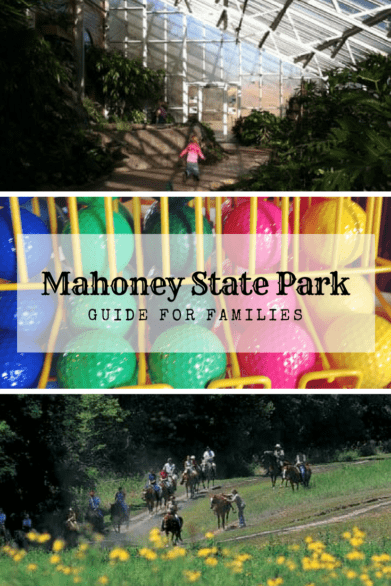 Basically, everything at the Mahoney State Park is family-friendly; what will be the most fun depends on the age of your children. Mine are happy running across a bridge or collecting rocks. Your older kids might require a little more to thrill them. Playgrounds: There are several, including a huge indoor play area (it has an admission fee but it’s awesome). 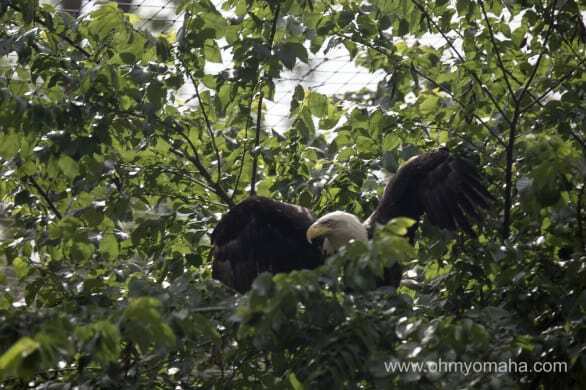 The biggest one is near the swimming pool – it has a separate jungle gym for smaller kids. Pony rides: Ages 3-9. Cost is $7 per kid. Pony rides are weather permitting and run daily through Aug. 13, and then they’re only on Saturdays and Sundays. Pool – Two water slides, wave pool and an area for small children. Very popular summer spot. 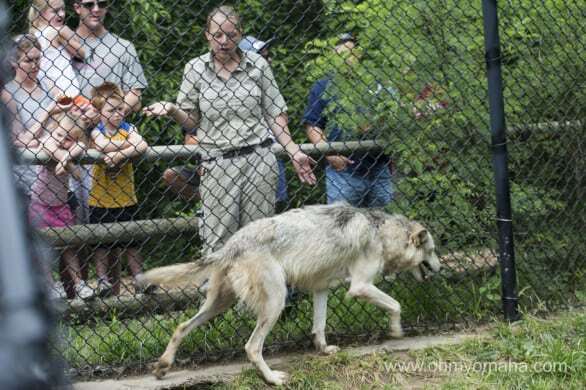 It costs $10 per adult, $8 per child (ages 3-12), and FREE for children 2 and younger. Paddleboats – Paddleboat rentals are down by the Owen Marina. They are $8 per boat for a half-hour rental. Fishing – Several fishing clinics are planned during the summer. 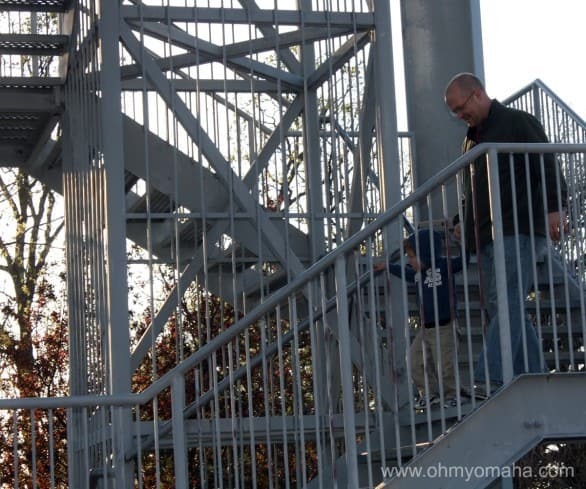 Explore the marina – For me, includes exploring the ice cream shop there. This is also where all the arts & craft stuff are. Hiking: If you’re lucky, you see a nearby passing train. 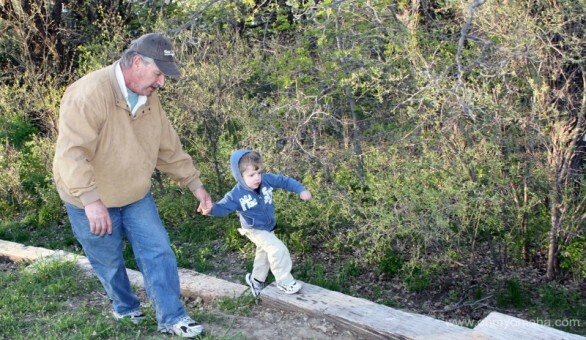 Farley on a hike with Grampy at Mahoney. Putt-putt golf – Mini golf is $3.50 per person. There’s also a driving range, and it’s $3 for a bucket of balls. Lookout tower: It’s a tall one with a great view, and climbing it is a useful tool for tiring out little ones. You climb the lookout tower a couple times and you’ll have buns of steel. Kountze Memorial Theater – Melodramas are often performed here. Usually there are two show options and tickets are $7 per adult and $5 per child (ages 12 and younger. 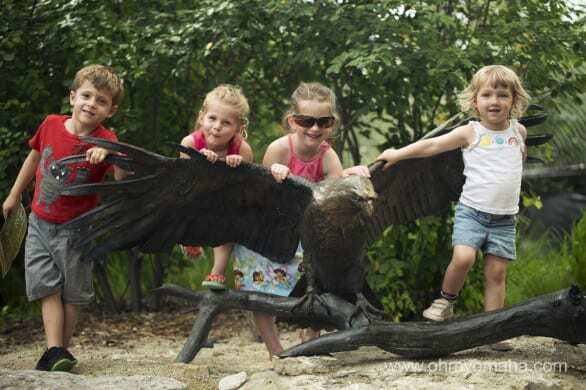 The family package, which is two adult tickets and two child tickets, is $20. 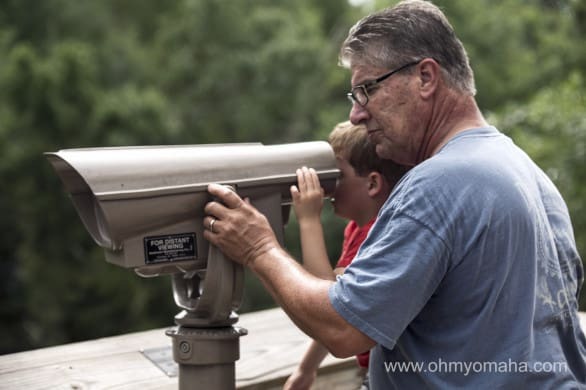 Stargazing: Climb the lookout tower for a spectacular view. There are a few clinics this summer sponsored by the Omaha Astronomical Society & Prairie Astronomy Club, who will bring telescopes. Check here for dates. Horseback riding – You must be 6 or older to ride a horse. Read more about trail rides at Mahoney here. The cost is $18 per person. 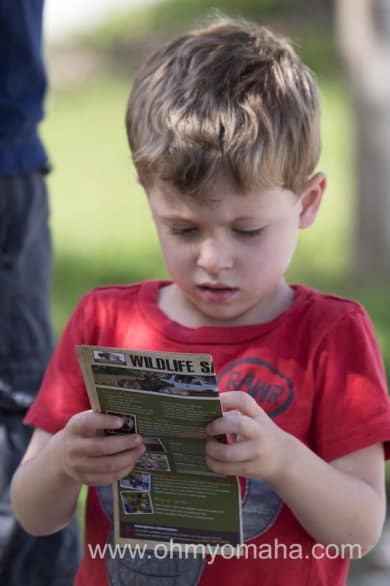 Nature programs – The park offers about several free programs, including ones focusing on horses, native reptiles, insects, prairie and hummingbird workshops, archery, nature hikes and fishing clinics. For hours and fees on activities, visit this link. Park’s phone number is 402-944-2523 . The Go Ape! Treetop Adventure opened April 28, 2018. This course includes Treetop Adventure and Treetop Junior, so it’s an outing suitable for kids and adults. 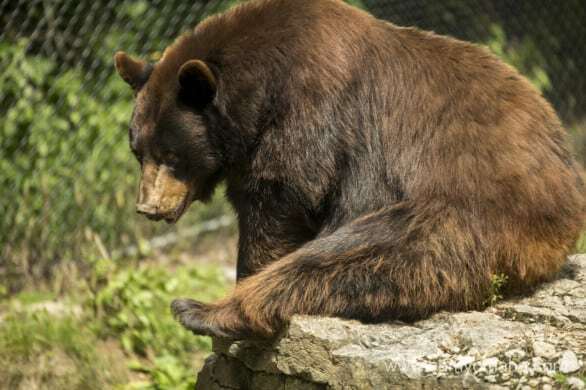 There is a height requirement of a minimum 4 feet 7 inches, and there is a maximum weight limit of 285 pounds. The course includes zip lines, obstacles and a ropes course, and expect it to last two to three hours. Cost is $49 for ages 16 and older and $39 for children 15 and younger. There must be a supervising adult age 19 or older to accompany children. Reservations are suggested. Strategic Air Command & Aerospace Museum: Planes and space exploration stuff. The new Children’s Learning Center opened in August 2016, and I wrote all about it here. Louisville State Recreation Area: There are plans to upgrade the park, including adding a water obstacle course! Read this post for details. 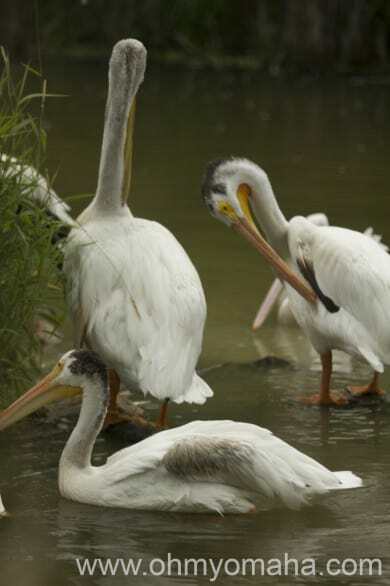 Schramm Park State Recreation Area: Trails for hiking and an aquarium with cheap admission. There are plans to upgrade the park! Read this post for details. 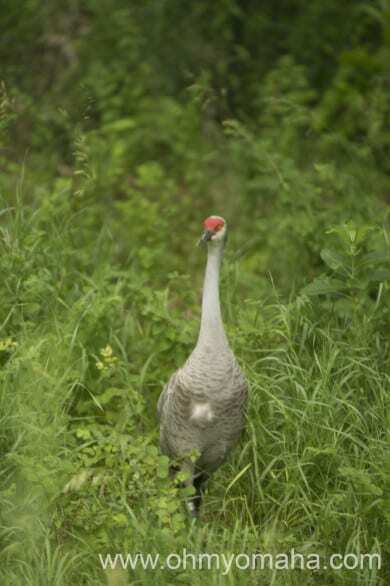 Platte River State Park: Great hiking trails, including one to a waterfall. 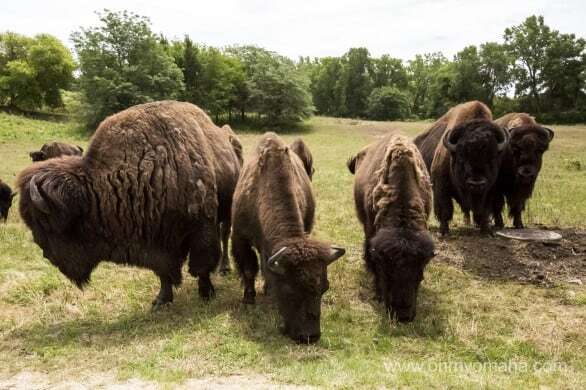 Here are 7 Reasons To Visit Platte River State Park. There are plans to upgrade the park! Read this post for details.